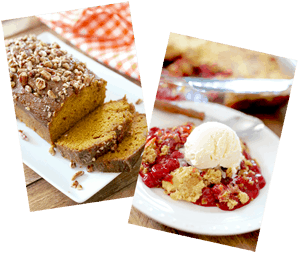 It just isn’t fall without a few, good ole pumpkin recipes. 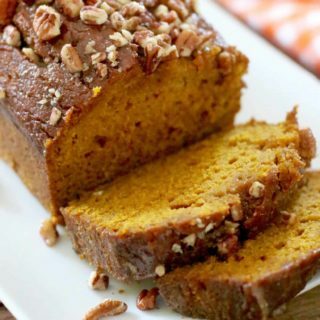 A favorite of many folks is pumpkin bread. 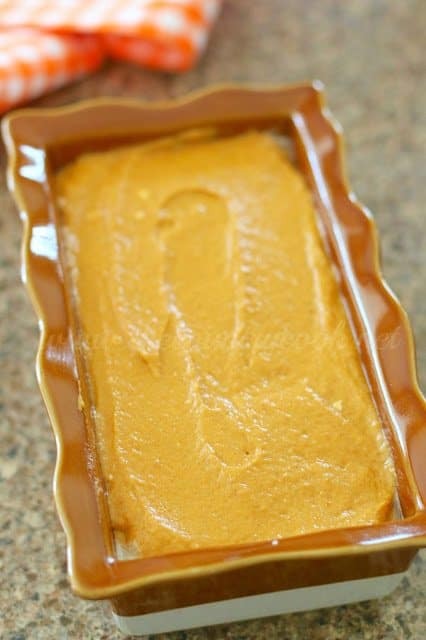 I gotta say it is one of my favorite things to make with pumpkin. Just like pumpkin pie, when you smell this baking in your oven, it just makes you happy. And you suddenly get the urge to put on a sweater, make some hot chocolate and go out and rake some leaves. Ok, raking the leaves might be taking it a bit too far. Cause that would require work. Although, you might be wanting some aerobic activity after you eat this. This bread is so unbelievably moist. Now, you could make this without the glaze, but really, why would you want to? If you’re gonna go through the trouble of making some good, sweet bread from scratch you might as well go all the way. Preheat oven to 325F degrees (350F if using a metal loaf pan.) Spray loaf pan with nonstick cooking spray. In a medium bowl, mix together flour, baking soda, baking powder, salt and spices. 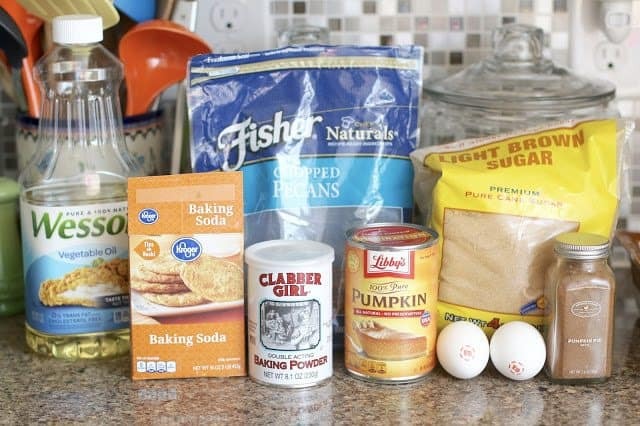 In a separate mixing bowl, mix together brown sugar, canned pumpkin, eggs, oil and water. Stir well to combine. 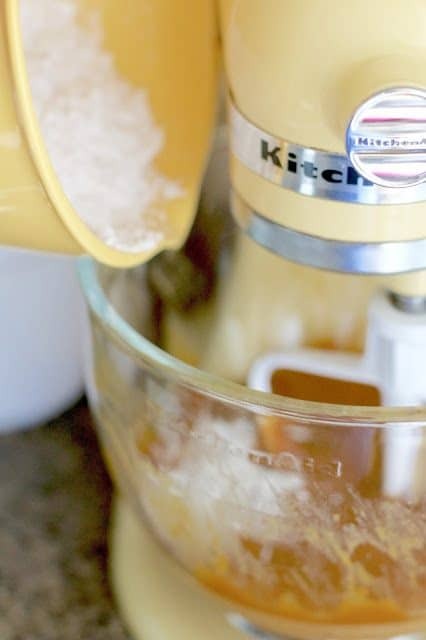 Add dry ingredients to wet and stir just until blended together. Be careful not to overmix. 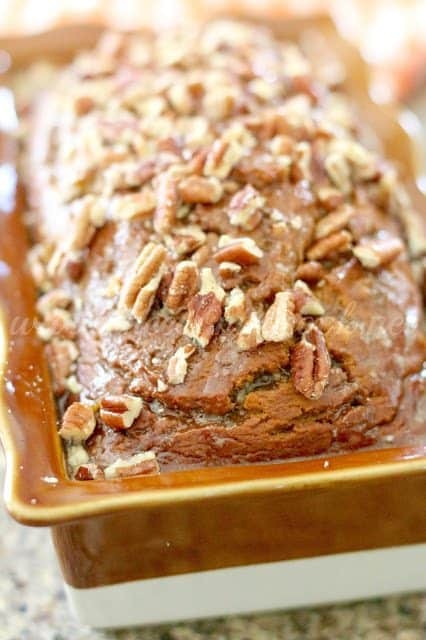 Pour into a large loaf pan and bake for about an hour to an hour and 15 minutes. Oven times will vary so just be sure to check your bread after the first 50 minutes. Insert a toothpick to test if it is completely baked through. On this occasion, I was using a smaller loaf pan, so I put the extra batter in a ramekin and baked it as an individual serving. I think it would be so adorable to make a bunch of these individual servings. When bread is almost finished, start working on the glaze. In a small saucepan, whisk together butter, brown sugar and milk. Bring it up to a boil for about 1- 2 minutes. Stir constantly so it doesn’t burn. When your bread is finished (while still warm), start poking a bunch of holes in it using a fork, toothpick or skewer. This will allow some of the glaze to seep into the bread. Be sure to put a paper towel or dish towel underneath your loaf pan too because once you start pouring the glaze, it may go a little over the edge if you pour too quickly like I usually do. Start pouring your warm glaze over the warm bread. Try to pour slowly to allow that glaze to seep in the holes you poked. Press chopped pecans (if you’re using) into the top of the bread. Allow to cool before slicing. Look at how cute my little ramekin pumpkin bread turned out! 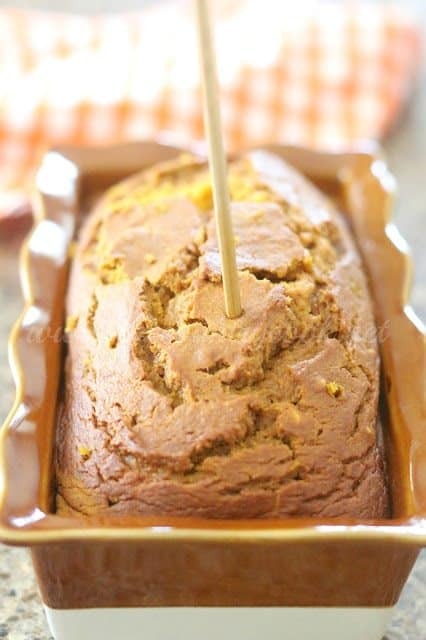 Pumpkin Bread with Brown Sugar Glaze is like pumpkin pie in the form of bread! 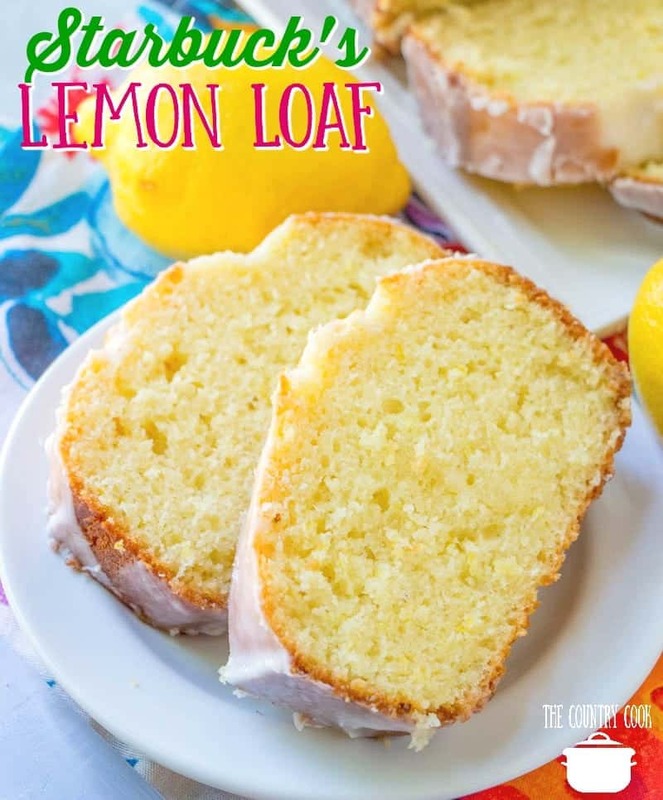 It is so moist and the glaze really makes it special. Preheat oven to 325F degrees (350F if using a metal loaf pan). 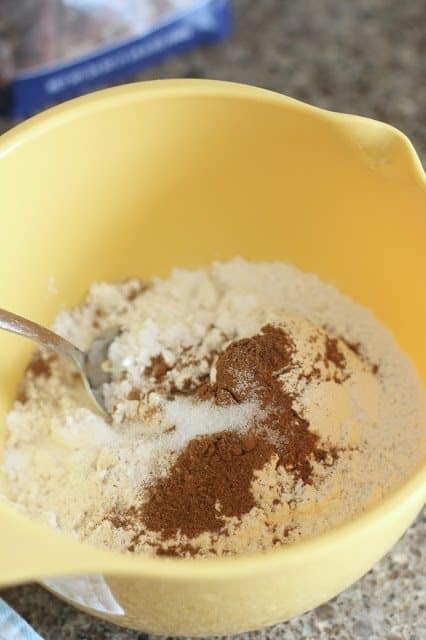 In a medium bowl, mix together flour, baking soda, baking powder, salt and spices. 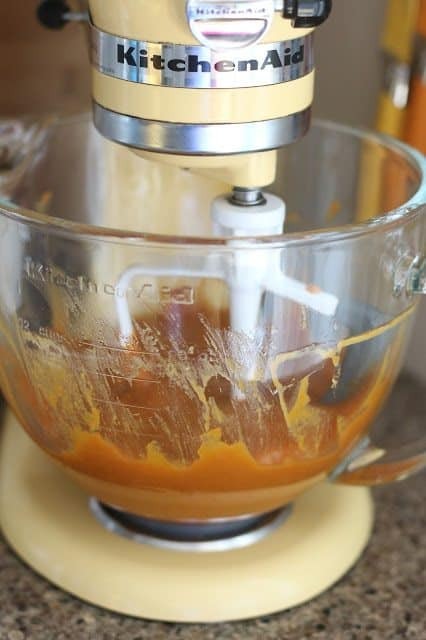 In a separate mixing bowl, mix together brown sugar, canned pumpkin, eggs, oil and water. 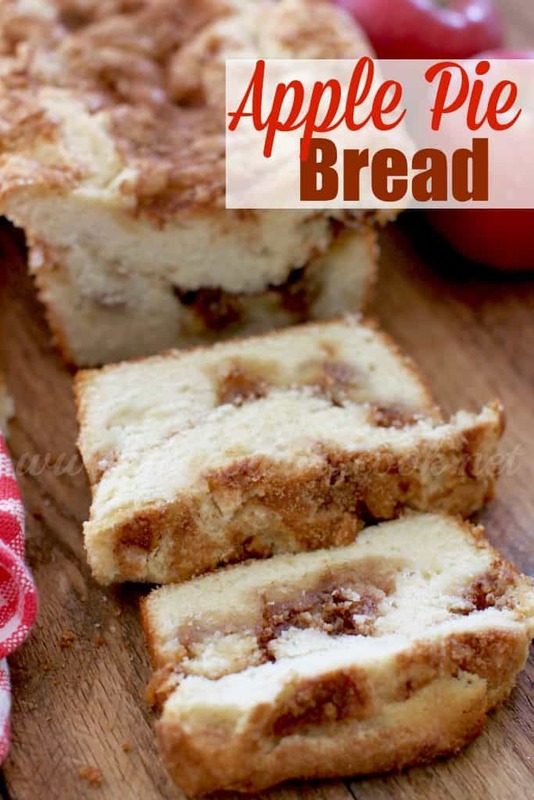 Pour into loaf pan and bake for about an hour to an hour and 15 minutes. Oven times will vary so just be sure to check your bread after the first 50 minutes. Insert a toothpick to test if it is completely baked through. When bread is almost finished, start working on the glaze. 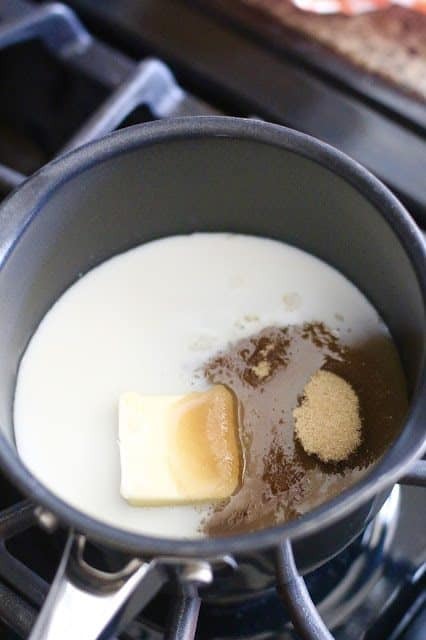 In a small saucepan, whisk together butter, brown sugar and milk. Bring it up to a boil for about 2 minutes. Stir constantly so it doesn't burn. When your bread is finished (while still warm), start poking a bunch of holes in it using a fork. This will allow some of the glaze to seep into the bread. Be sure to put a paper towel underneath your loaf pan too because once you start pouring the glaze, it may go a little over the edge. Start pouring your warm glaze over the warm bread. Try to pour slowly to allow that glaze to seep in the holes you poked. Press chopped pecans (if you're using) into the top of the bread. Allow to cool before slicing. Andrea, I hope you enjoyed it! Chris – that is so wonderful to hear! Thank you so much for taking the time to come back & let me know how it turned out for you!! I just had to come back and tell you – this is DELICIOUS (I swear there hasn't been anything on your site that I've tried and HAVEN'T liked). 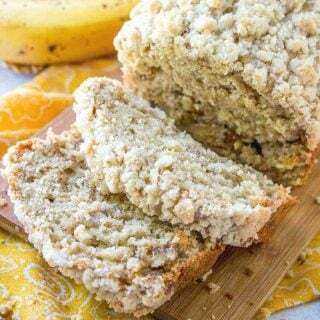 And FYI – I haven't had much luck with banana breads, zucchini breads, etc keeping their shape after they come out of the oven – most of the time they fall (high altitude) but this one didn't. It looked beautiful and stayed beautiful. Wendy, I hope you like this one!! I just made it again last week. 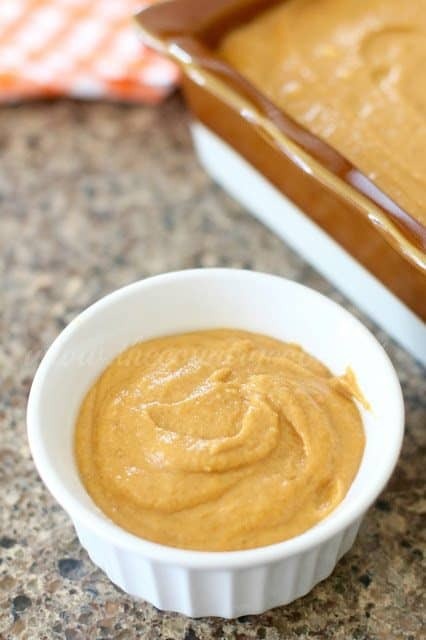 It doesn't have to be fall to enjoy the flavors of pumpkin! 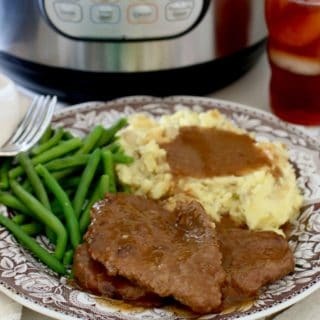 This picture/recipe just stopped me in my tracks! 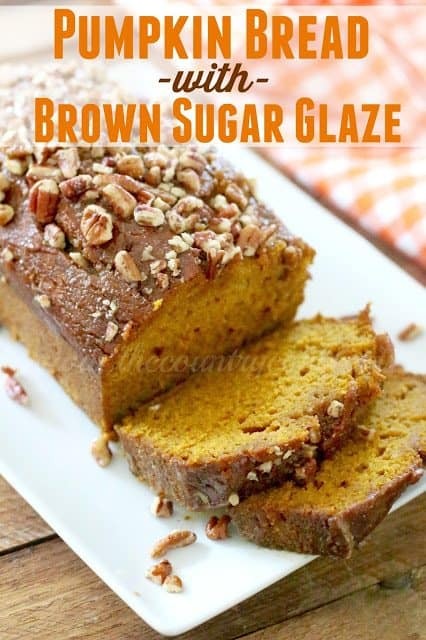 It is winter now and I am not waiting to till next fall to make this one, I love pumpkin bread and the glaze just put this recipe to the top of my list. Thank you for all this "Yumminess"!!! I brought this to work today for a little "breakfast club" we have once a week. 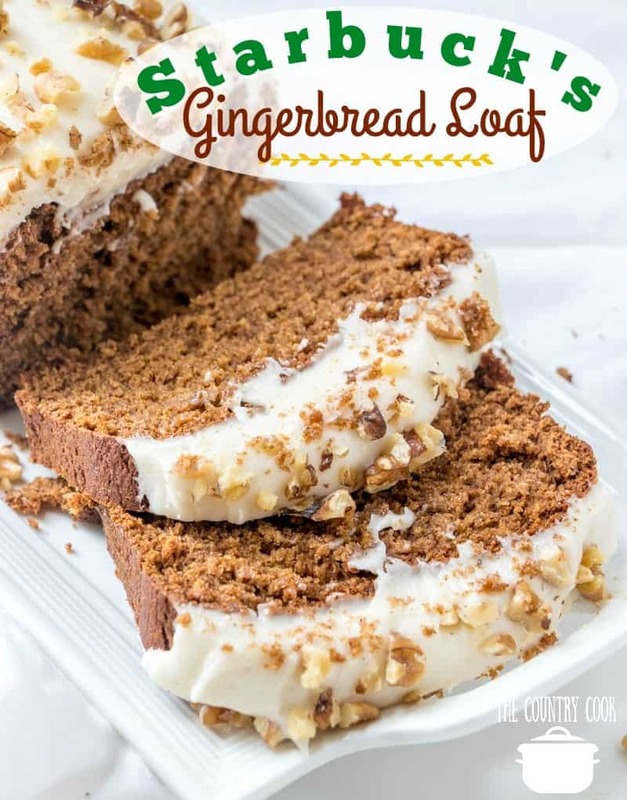 Everyone said this was the best pumpkin bread they ever had! Thanks for the delicious recipe! 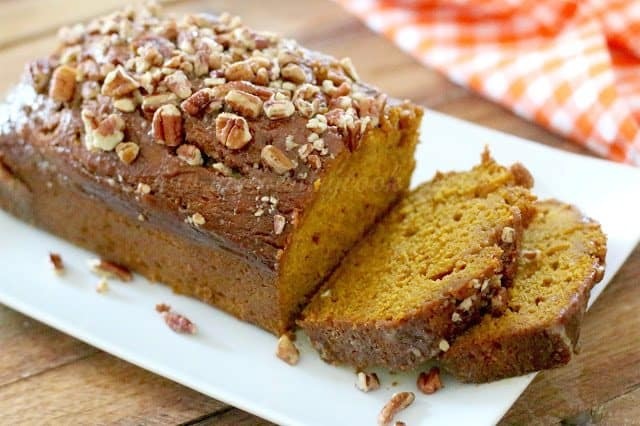 I don't think I've ever commented on anyone's page before, but I had to get back on here to tell you that your pumpkin bread is absolutely delicious! My family said it's the best they've ever had! 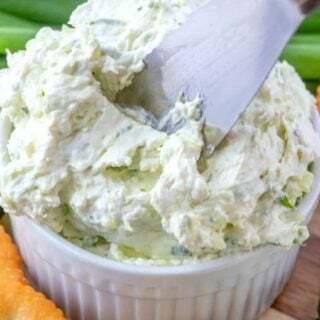 Thank you for you're blog and all the wonderful recipes you share! I'm baking this in the oven now and it.smells.SOOOO.good!! I can't wait to try it! I was looking for a special recipe this Thanksgiving for my family. I have made Pumpkin Bread in the past and have used the same recipe for years. I was so excited when I saw your recipe! 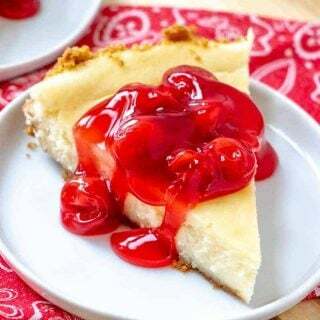 It looks yummy and sooo easy. Mine does not have a glaze and so I am doubley excited to try this. Thanks you so very much! Can it be made with sweet potatoes? Yes, I would like to know could it be made with sweet potatoes as well, and taste just as good. I love sweet potatoes! And this looks so scrumptious!!! HELLO I just love your site. I tried to enter to win an iPad but the form would not open so I could fill it out. This is amazing! I made it twice, the first time I used dark brown sugar for both the bread and the glaze (as that was all I had) and it was ok. The second time I followed your instruction exactly (and had light brown sugar!) and it was WONDERFUL!! Even my non-pumpkin-fan-husband liked it! So wonderful!! 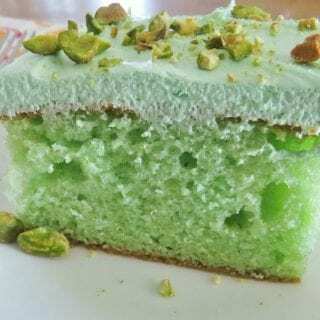 Thanks for sharing this, and all of your lovely recipes! 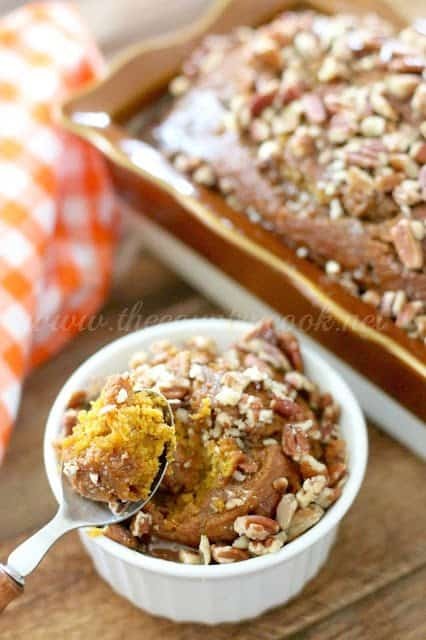 I made this bread the other day and it is by far the very best pumpkin bread I have ever eaten!! I always thought that my Mom's was the best, but this has it beat!! Thanks for the great recipe!! Made this today….one word…Awesome! 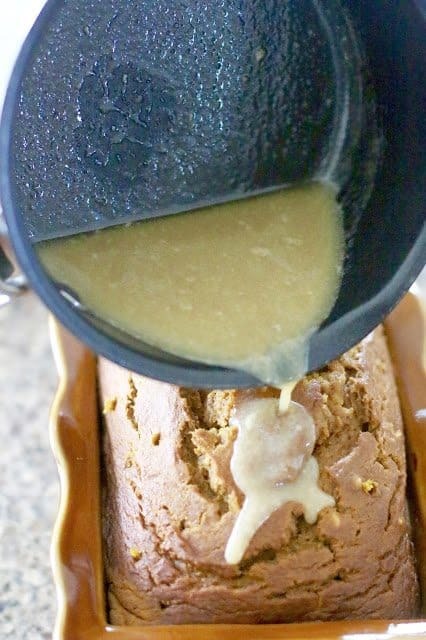 I have never had pumpkin bread that was as moist as this..and the glaze….my my don't get me started on the glaze!! Hi! I'm wondering if I could use nuts in it? And would cream cheese frosting taste good on it? 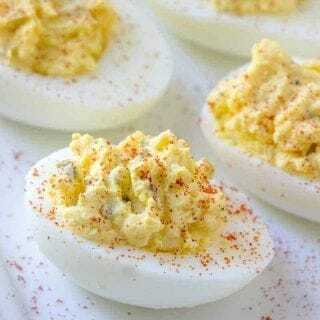 Thanks…and I love your recipes! Jolene, you can put nuts in it and change up the glaze for a cream cheese frosting if you prefer. I love your website! And I’m eager to try making your Pumpkin Bread with Brown Sugar Glaze. You also mention pouring some of the batter into a Ramekin dish to bake. How long would you bake it for, if you wanted to make a bunch of small ones? What size of loaf pan to use to make the pumpkin bread, if just says a large size of pan. So so good! Just finished baking this pumpkin bread and it’s definitely a keeper! !